Protect your site from thiefs! Hide your PayPal links! Encrypt e-mail links and stop spam! Lock pages in your site! Automatically break your pages out of frames! Password protect any page! And more! The brand new HTML-Protector 2004 software will completely secure any Web site, no matter what sort of host you're using. Just launch the software, select the files you want to protect and how you'd like to protect them - and click! Software designed to protect web page HTML source code. Protect source code and content of your website from thieves and spam robots. XP-Protector - the ultimate solution for parental control. dotNet Protector is a powerful .NET code protection system. Qweas is providing links to HTML-Protector 1.0 as a courtesy, and makes no representations regarding HTML-Protector or any other applications or any information related thereto. Any questions, complaints or claims regarding this application HTML-Protector 1.0 must be directed to the appropriate software vendor. 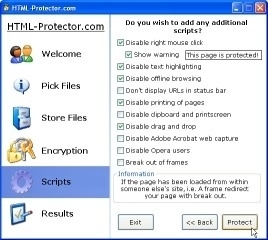 You may click the publisher link of HTML-Protector on the top of this page to get more details about the vendor.